The next layer down is made up of framework documents and their associated credentials. Here you have project management body of knowledge’s’ which capture what is considered good professional project management practice across the entire project management profession. The largest example of this is the PMBOK® Guide from the Project Management Institute (PMI) which is a global organization. Frameworks contain much more detailed information about project management processes, tools and techniques than standards such as ISO21500. The Association for Project Management (APM), which is largely based in Europe, also has its own Body of Knowledge as well. Despite this extra information they do not present specifics ways of completing projects – that’s a job for methodologies which we cover soon. 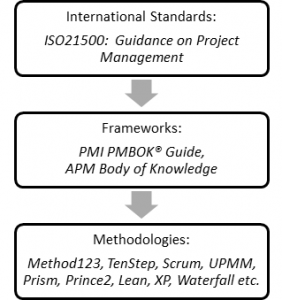 There are many similarities between the PMBOK® Guide, APM BoK, and ISO21500, but also a few differences mainly around slight naming and content differences of some processes and process groups. We would expect these differences to be ironed out over the next few years. PMI offers the Project Management Professional (PMP®) and Certified Associate in Project Management (CAPM®) credential, and APM offers its own 4 stage certification for project managers. All of these credentials are framework credentials and are at a much more senior and detailed level than methodology credentials which we cover next. I recommend all project managers plan on gaining a framework credential at some point in their career – the sooner the better. At the bottom of the hierarchy are specific project management methodologies developed from frameworks which in turn align with standards. Each methodology can be traced back to a particular framework document, and its ancillary documents such as extensions to the PMI PMBOK® Guide. Each methodology is particularly suitable for different projects based on industry, size, value, complexity and risk. For example Scrum is great for fast moving iterative IT projects, Prince2 for low complexity IT projects, and Method123 for defined complex projects from a range of industries. There are usually no, or very little, prerequisites needed to gain a methodology certification so they are generally not any guide to a project managers experience, ability or seniority. My opinion is that you should only look at becoming a certified in a particular project management methodology if your organization is actually going to use that methodology appropriately. Otherwise I strongly suggest getting a framework credential such as PMP® and gain the skills needed to develop your own project management methodology. Anyway, that’s the explanation over. I hope you found it useful and you now feel more informed about PM Standards, Frameworks and Methodologies. This blog was originally posted on http://www.seanwhitafer.com but the Auldhouse editor felt it was a deserving of republication.